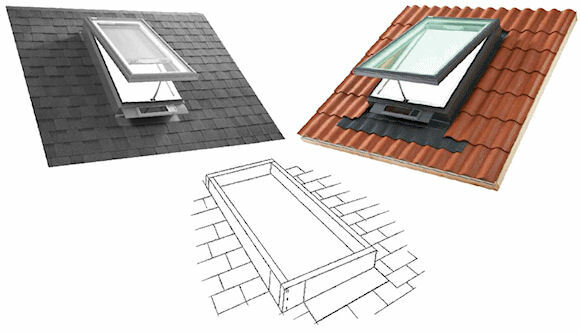 Eight factory installed blinds are available to include in the purchase of your skylight. If the Solar Powered "Fresh Air" Skylight is ordered with a factory installed blind, the skylight and blind will arrive pre-programmed to one unified remote control. The blind uses its own independent, built-in, solar panel and power system. VCS 2222 - Solar Powered "Fresh Air" Curb Mount Skylight by VELUX- 22 1/2" x 22 1/2"
VCS 2234 - Solar Powered "Fresh Air" Curb Mount Skylight by VELUX- 22 1/2" x 34 1/2"
VCS 2246 - Solar Powered "Fresh Air" Curb Mount Skylight by VELUX- 22 1/2" x 46 1/2"
VCS 3030 - Solar Powered "Fresh Air" Curb Mount Skylight by VELUX- 30 1/2" x 30 1/2"
VCS 3046 - Solar Powered "Fresh Air" Curb Mount Skylight by VELUX- 30 1/2" x 46 1/2"
VCS 3434 - Solar Powered "Fresh Air" Curb Mount Skylight by VELUX- 34 1/2" x 34 1/2"
VCS 4646 - Solar Powered "Fresh Air" Curb Mount Skylight by VELUX- 46 1/2" x46 1/2"